In April 1803, the still young United States of America purchased the Louisiana Territory from Napoleon. That was actually a bigger deal than it sounds today, the territory back then was much larger than today’s state of Louisiana, it spanned from the Mississippi all the way to the Rocky Mountains and encompassed fifteen states and two Canadian provinces completely or at least in parts. Then-president Thomas Jefferson decided to do what any diligent buyer of large chunks of real estate would do: figure out what exactly he had gotten for his 15 million dollars. (Incidentally, that’s about 4 cents per acre according to Wikipedia at the time, equivalent to 42 cents per acre now. In metric units, that’s about 25 degrees per liter, or something like that.) He sent an expedition of army volunteers under Captain Lewis and Second Lieutenant Clark on an expedition to survey the new territories, lay a credible claim to them before any of the European nations would have a chance to do so, and reach the Pacific Ocean because of superior sushi reasons. But Thomas Jefferson was a smart man who wouldn’t put all his eggs in one basket, and Lewis and Clark were common surnames at the time. The President sent up to five expeditions, all with the same surnames to simplify the historical record, and if things had gone differently the first people to cross the whole western US might not have been Meriwether Lewis and William Clark, army officers, but for instance Harold Lewis, butcher, and Jürgen Clark, baker of German ancestry. 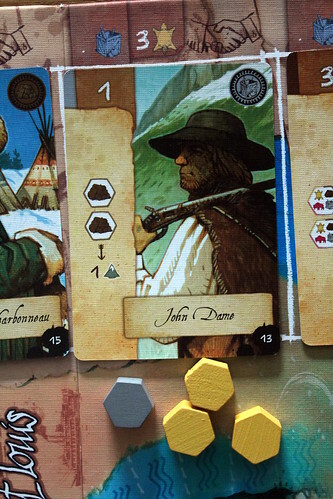 The many-expedition theory is very controversial, but experimental historian game designer Cédrick Chaboussit makes a strong argument for it in his game Lewis & Clark – The Expedition. And so it is that up to five expeditions set out from St. Louis on their way to the Pacific Ocean. Their goal is, for a change, not to collect victory points but simply to be the first expedition to reach the coast. Because no one ever talks about the second guy to get there. Each expedition is equipped with three boats to carry equipment and food and a number of canoes used by their Native American helpers without whom the expedition wouldn’t even have left the car park. Since those helpers are meeples – it’s been too long since I had a game with meeples – we’ll call them Meeplians. They also have some starting resources, only one Meeplian helper, and six Character Cards representing the starting expedition. Thus equipped, they embark on the deceptively short journey of 38 squares along the river. Each turn, an expedition decides to do one of two things: send a Meeplian to one of the local villages to trade, or play one of the expedition’s character cards. Sending a Meeplian to trade is simple, you place him in a village and get the action associated with that village. You may take some of the basic resources – food, fur, wood or equipment – or you may trade resources for transportation – horses or canoes – or you may buy more boats for your expedition. It’s that easy, but not always possible. Meeplians are a hard resource to come by, and most of the villages only have space for one of them. That leaves you with he option to play a Character Card. 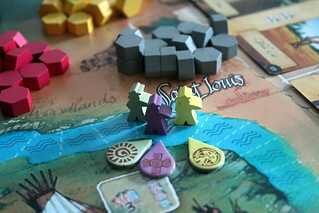 Lewis & Clark is a deck-building game at heart, without the lucky part of drawing the right cards together. You always have all unplayed cards in your hand, no drawing involved. You can not get any of those cards back until you make your camp – see below. So you get to use your Characters once each before you have to stop and give them a rest. But you don’t even get to use all of them, because you need Strength to play a card. You can give it Strength by placing a Meeplian on it, or by playing another Character Card face down and using the one to three Meeplians depicted on the back for Strength. Since real Meeplians are more rare, especially early in the game, you’ll use almost half your cards for Strength, not for their effect. That forces you to make some tough decisions already, but it gets worse. One point of Strength is enough to use a card action, but for most cards you can choose to put two or three points of Strength and perform the action two or three times. That sounds great in theory, but it doesn’t make the decision what to do any easier. Your starter deck only has six cards. Four of them collect one of the four basic resources each. But they don’t collect just one piece of wood, or one fur, they collect one for each corresponding symbol your already played cards are showing, one one for each corresponding symbol the cards of your two neighbours are showing. Timing is important for these cards, to get the most resources you want to play them just before your neighbours build their camp and pick up their cards again. The resources you collect have to be carried around. Initially, your expedition’s boats have space for 11 resources at most, so you are forced to be a bit picky. Your next card is your Interpreter. He is your only option to get fresh Meeplians into your expedition. Playing the Interpreter, you remove all the Meeplians from the villages and move them to the Powwow area in the middle of the board, then you take any number of them and place them in your expedition’s canoes. There’s another element of timing there, you obviously want to get as many Meeplians as possible, but if you wait too long someone else will take them all before you. Your final card, the Commander, finally sets your expedition in motion. You pay resources for squares moved on the river, food or canoes for water squares, horses to cross the mountains. The Commander is the most common card to play more than one point of Strength on, because that is the only way to pay more than one resource in a turn and consequently move further. With him as your only movement card, it makes a big difference wether you pay one canoe for four squares or three canoes for twelve – that’s almost one third of the total expedition. Lewis & Clark wouldn’t be much of a deck-building game if you only had those cards. In addition to the actions described above, you may always buy a new card on your turn out of the five available at the time. The more to the back of the line a card is, the more resources you have to pay for it. The cards you can buy have some of the same actions as your Starting Deck or the Meeplian villages, but more efficiently. Buffalo Medicine, third chief of the Teton Sioux, for example, can get you a canoe for only one food, instead of the two wood required at the Honest Horse Canoe Dealership in the village. Joseph Barter moves your expedition five squares along the river for one canoe, instead of four like your Commander does, but he’s not as versatile and can not use food or cross mountains. But other Characters perform special actions you would not otherwise have access to, like Yankton Nakota chief Weuche, who lets you expedition move as many squares as there are equipment symbols visible in your and your neighbours’ playing areas. It’s a beautiful bit of trivia that all Character Cards are not only unique they are all people who were in the expedition or encountered along the way, according to Lewis’ diaries. Finally, and very importantly, you may set up your camp at any time during your turn, before or after your other actions. Your camp moves up to the square your expedition is in. If only it were that easy. Before the camp moves up to your expedition, your expedition moves backwards. For every card still in your hand, your expedition moves one step backwards. For resources and Meeplians you still carry around, the size of your problem varies. Resources in your first boat are free. If there are any resources in your second boat, you move back one step. For every resource in your third boat, you move back one step. Meeplians work the same, the single Meeplian in your first canoe is free, every Meeplian beyond that moves you back one space. Then, and only then, if your expedition is still ahead of your camp, your camp moves forward. And there’s no guarantee that your expedition is still ahead at this point, because it turns out that Lewis & Clark is a bone hard resource management game. You obviously want as many resources as you can get to drive your expedition forward and perform other actions, but at the moment you make camp, ideally, your boats and canoes should be empty or you may find yourself halfway to Paris. Paris, France, that is. Getting all the way to the East Coast this way is not easy. And that’s a key realization about Lewis & Clark: not easy. When I unpacked the game for the first time, I looked at the small area of the board that is the actual expedition route, and I thought: easy. And I kept thinking that right up to the point when I made my first camp and ended up three spaces behind St. Louis. That was a wakeup call for me. 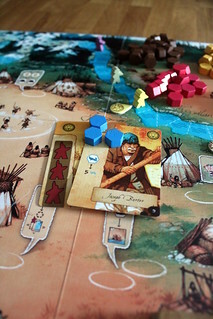 Lewis & Clark looks all nice and child friendly, with its beautifully illustrated board, its equally pretty character cards – honestly, Vincent Dutrait did an excellent job with this game’s art – and its Meeplians, but under all that, its a game that you have to think about. Every card you buy that you can’t use will set you back, as will every resource you pick up but can’t use before your next camp. The same goes for your Meeplians. It’s a very realistic game that way: every person and every bit of equipment you have with you that doesn’t serve a purpose does only one thing: it slows you down. 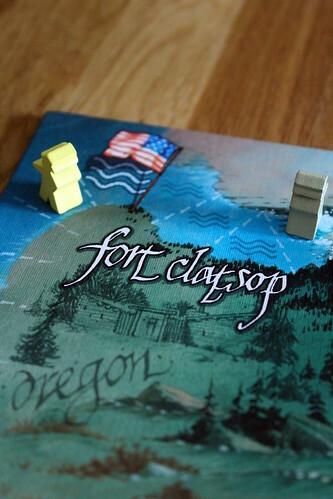 Lewis & Clark is not a very difficult game to learn, the rules are easy to understand. There is very little luck involved in the whole game, the only thing bad luck can do to you is not give you a card that you need at the right time, and that’s a rare misfortune. The deck-building part of Lewis & Clark is very similar to Kennerspiel des Jahres Nominee Concordia: you have all your cards in hand, can only play them once before taking an action to retrieve them and buy fresh cards from a line where early access is more expensive. Since I love Concordia, that similarity is absolutely a good thing. The rest of the two games is very different, however, and where Concordia has deeper long term strategy Lewis & Clark has more interaction between the players. There is not much competition for resources, except for the Character Cards, but the timing of your actions depends strongly on the other players. It’s not only collecting the resources when everyone has their cards on the table, it continues with the Meeplians to pick up for your expedition as well as with placing them before the village you need is full. Even the small rule that you get to skip occupied spots on the river if your move would end on one becomes significant more often than you’d think. Lewis & Clark turned out to be a deep and very interactive game where every decision really is meaningful. Together with its good looks and the fact that it has meeples, that makes it an all-round great game that we thoroughly enjoyed playing.